In this video we review some of the basic information that the network tab gives us, including the number of downloaded files and the size of each one. Again our focus here is going to be on optimizing the speed of the initial page load, and there's two significant factors that come into play with this that are under our control, and then a number of other factors that aren't but that we should be aware of. The two things that are under our control are the number of files that are required for the website to load and second the size of those files. So let's look at dev tools here under the network tab to get a sense of how long our site took to load and why. So if I make this full screen we can get a better picture here. Each one of these lines is a file that is downloaded from our server by the browser. Total it looks like there were 18 requests. The world of front end development has come a long way in the last several years with the addition of responsive design, CSS preprocessors like SASS, and the ever widening range of devices and environments we use to navigate the web. At the same time, many of us are able to generate fully functioning web sites using CMS's like Drupal without ever touching HTML or CSS - the basic building blocks of the web. Because of that, many of us end up floundering when we need to make even minor adjustments to the markup or presentation of a project, since we don't have the experience needed to break down what our CMS is actually doing for us. If you are seeking to learn modern front end development practices and tools in order to increase your value in the workplace or become more independent with your own projects, this collection was created with you in mind. 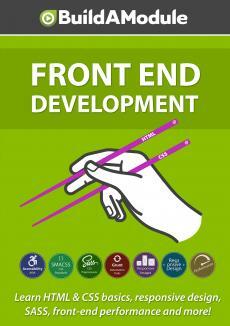 Front end development is a highly sought-after skill set and is highly portable since it can be coupled with virtually any kind of back-end. Tools like Jekyll allow you to build content-rich sites without the need for a specific backend, and the focus in Drupal 8 on a 'headless Drupal' is allowing developers to leverage Drupal as a back end while still choosing the right tools to generate the HTML and CSS of the front end. 1:41How to center an HTML element by setting horizontal margin to "auto"
0:41How to prevent CSS from adding padding and border to height and width with "box-sizing"
0:39Summary of which ways we can approach this project "mobile first"
4:06Adding breakpoints to collapse our footer into a single column using "max-width"
4:53How to convert desktop-first CSS to mobile-first CSS by switching to "min-width"
1:15Converting our carousel's "max-width" breakpoints to "min-width"
4:57When it makes sense to use "max-width" and converting header breakpoints to "min-width"
1:15Converting our slideshow breakpoints to "min-width"
1:51Congratulations on completing "Front End Development!"